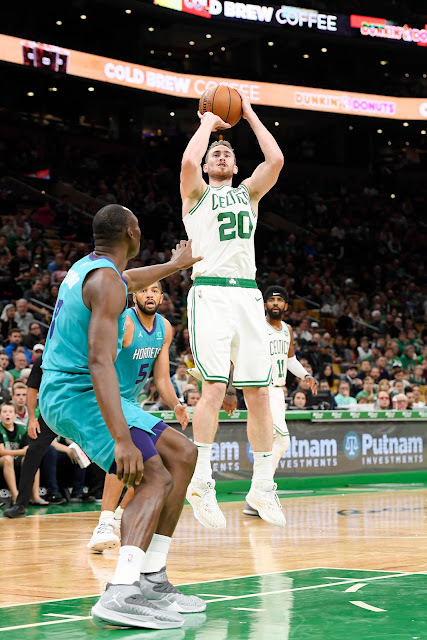 October 2nd of 2017 was the last time Gordon Hayward donned a Celtics jersey in TD Garden. That was the last time C's fans saw Hayward on the parquet. Gordon Hayward: "It was great being in front of our own fans for the first time. That was a special feeling for me. Obviously still have a lot of improve on. I think rust is there, for sure, for me. But it was Game 2 after not playing for a year, so it’ll come back." The rust is understandable. This is the second time Hayward's been in a competitive game since October 17th of last year. That naturally explains his 1-for-7 shooting and meager 4 points. Hayward and the Celtics take on the Cavaliers in Boston on Tuesday night. We'll see if Hayward plays and if he can find his shot before the regular season starts up in the middle of October. Follow Topher Lane on Twitter, @Topher_L. Photo credit: Brain Babineau/NBAE via Getty Images.